Support the Denton Police Department. BECOME A MEMBER TODAY! Money is no substitute for loss, but during that emotional and financial crisis, the knowledge that the community cares is very meaningful and appreciated. 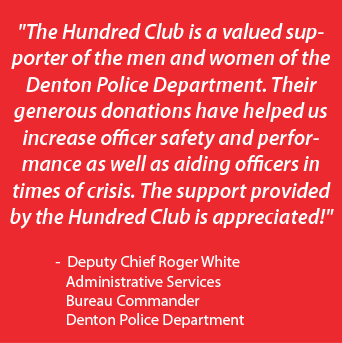 When an emergency or need arises with one of our Denton Police officers, the Denton 100 Club immediately responds to their needs with the help of your donations. No contribution is too small to help those who protect us on a daily basis. If you are interested in finding out more, contact us at the email address below. We are a recognized 501 (c) (3) non-profit organization, and your contributions are tax-deductible. Your tax-deductible membership includes a 100 Club window decal to proudly show support of the Denton Police Officers, as well as the satisfaction of knowing you are making a positive impact on the lives of Denton Police Officers and their families. We would love your yearly membership, and we appreciate any amount you can give directly to the Denton Police Department.